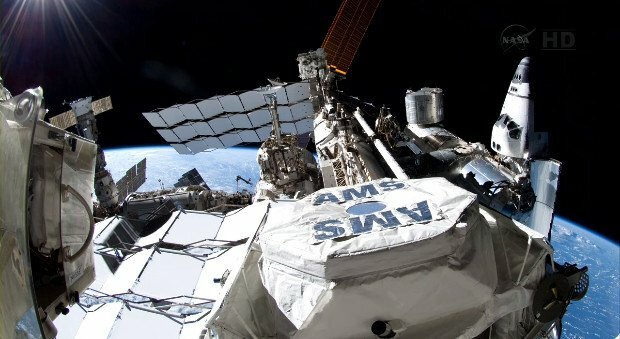 The first signs of dark matter, a mysterious component of the Universe, have been observed during a $2 billion experiment on the International Space Station (ISS). The Alpha Magnetic Spectrometer (AMS) surveys the sky for high-energy particles, or cosmic rays. The AMS – a particle physics machine nicknamed the “Space LHC” in reference to the Large Hadron Collider here on Earth – has seen evidence for what could be dark matter colliding with itself in a process known as “annihilation”. However, astronomers stress that a precise description of this enigmatic cosmic constituent is still some way off. “It could take a few more years,” said AMS deputy spokesman Roberto Battiston, a professor of physics at the University of Perugia, Italy. “But the accuracy that AMS is displaying is far greater than past experiments, so we’re getting closer to unveiling the cause of the particle events we’re detecting,” he said. Dark matter accounts for most of the mass in the Universe. Galaxies, for example, could not rotate the way they do and hold their shape without the presence of dark matter. AMS has been hunting for some indirect measures of dark matter’s properties. It counts the numbers of electrons and their anti-matter counterparts – known as positrons – falling on to a battery of detectors. Theory suggests that showers of these particles should be produced when dark-matter particles collide somewhere in space and destroy each other. In a paper in the journal Physical Review Letters, the AMS team reports the observation of a slight excess of positrons in the positron-electron count – an outcome expected of these dark matter annihilations. The group also says the positrons fall on the AMS from all directions in the sky with no particular variation over time. This is important because specific locations or timing variations in the signal could indicate a more conventional source for the particles, such as a pulsar (a type of neutron star). AMS was placed on the ISS in 2011. The longer it operates, the better its statistics will be and the more definitive scientists can be in their statements. Lead spokesman, Prof. Sam Ting, said the AMS Collaboration would proceed slowly and cautiously. “It took us 18 years to do this experiment and we want to do it very carefully,” he told a seminar at the European Laboratory for Particle Physics (CERN) in Geneva. The Physical Review Letters paper reports the positron-electron count in the energy range of 0.5 to 350 gigaelectronvolts (GeV). The behavior of the positron excess across this energy spectrum fits with the researchers’ expectations. However, the “smoking gun” signature would be to see a rise in this ratio and then a dramatic fall. This has yet to be observed. Only more data from above 350 GeV will resolve this issue. “With time, we should be able to tell you whether it drops off very quickly, in which case it will be the result of dark matter collisions – which means we’ve found dark matter; or that it drops off very slowly which means the positrons come from pulsars,” Prof. Sam Ting explained. Getting a definitive detection and nailing some of its properties would open up dark matter to further study. AMS is just one of several techniques being used by researchers to try to uncover the nature of dark matter. There are laboratories on Earth that are attempting to make more direct detections as the elusive particles pass though containers of the elements xenon or argon, held deep underground. The Large Hadron Collider (LHC), too, is involved in the hunt. It hopes to produce dark matter particles in its accelerator. A precise description of this mysterious component is now an urgent objective for modern physics. Normal matter, the material we can see with telescopes (all the stars and galaxies), contributes just 4.9% of the mass/energy density of the Universe. Dark matter is a far bigger constituent, making up 26.8%. This figure was recently raised following studies of the cosmos by the European Space Agency’s Planck telescope. The value is now nearly a fifth up on previous estimates. Dark energy is the component that contributes most to the mass/energy density of the Universe at 68.3%. Dark energy is the name given to the force thought to be accelerating the expansion of the Universe. Its character is even more obscure to science than dark matter.